Knee Defender fight: Should airlines divert flights because of legroom battles? 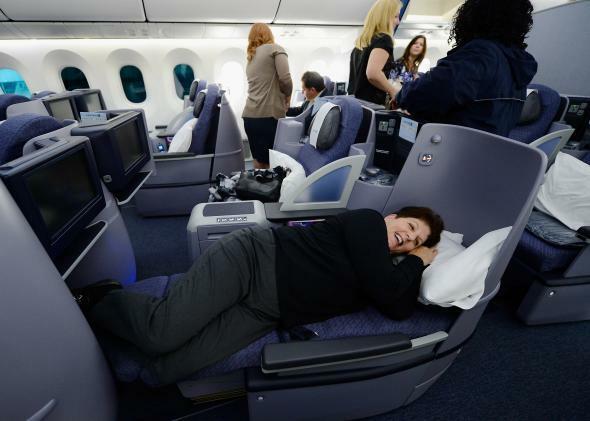 United Airlines’ new reclining Business First class seats on the Boeing 787 Dreamliner. A little over a week ago, United Airlines Flight 1462 from Newark, New Jersey, to Denver was forced to divert midtrip because two passengers got into a fight over legroom. Since then, not one but two additional U.S. flights have been forced to make unplanned landings because of similar in-air squabbles. On Aug. 27, an American Airlines flight from Miami to Paris was diverted to Boston after a passenger began quarreling with the traveler in front of him over a reclining seat and, when the dispute escalated, grabbed the arm of a crew member. Then on Sunday, a Delta flight from New York to West Palm Beach, Florida, landed prematurely in Jacksonville after a passenger who reclined angered a woman who’d been sleeping on the tray table. The seeming explosion of in-flight battles over legroom is being dubbed “recline rage” and attributed to the ever-smaller seats that today’s airlines cram passengers into. Over the past few decades, seats have dwindled by about two inches in width and shrunk two to six inches between rows; the most tightly packed seats now allot a mere 28 inches in that regard. Passengers have unhelpfully done just the opposite—growing taller and packing on extra pounds. “It’s No Longer Safe to Recline Your Airplane Seat,” declared an Associated Press headline earlier this week. Clearly, things are getting a little out of hand in the skies. But does the recent spate of diverted flights signal an epidemic of “recline rage,” or is this a relatively common problem that has only recently gotten media attention? “The incidence of air rage has been going up consistently year by year,” says Robert Mann, a former airline executive and president of airline consulting firm R.W. Mann & Co. Customers are increasingly upset with the tight quarters they’ve been given by airlines and tend to give lower satisfaction marks to fuller flights. “It’s not surprising that in August, which is the peak season for North American airlines, that this would manifest more frequently,” he says. Then again, more frequently still doesn’t mean this sort of incident is common. According to Airlines for America, diversions of any type are “extremely rare.” Only one in 500 flights is typically diverted for reasons ranging from weather to mechanical issues to medical emergencies. Diversions from passenger disruption are much more infrequent. The International Air Transport Association told the AP that unruly passengers are an “escalating problem” that have disrupted one in every 1,300 flights over the past three years. The Department of Transportation doesn’t break out specific reasons for diversions. With August wrapped up and Labor Day weekend over, the instances of legroom-induced air rage will hopefully start to taper off. But at the rate we’ve been going it seems safe to add: Recline at your own risk.